Published by Terese Carlson 15 March, 2019 in Trade and industry group. The fair Skarpt Läge set a new visitor record with 1831 participants attending the job fair at the Swedish Exhibition & Congress Center. The purpose of the fair is to create work opportunities for young adults. – We can only say that it was a success with the 1831 visitors, Fredrik Karlsson Chairman of the association Skarpt Läge says. On Friday February 22, Skarpt Läge set a record in the number of participants who attended the job fair at the Swedish Exhibition Center in Gothenburg. The previous record was 1147 visitors. For the sixth year in a row, young adults between the ages of 18 and 30 were matched with companies that were able to offer jobs on site. There were 46 exhibitors who represented 64 different workplaces and approximately 1100 work opportunities were available. – It was magic! Says Eva Dunér, owner operator at four Mc Donald’s restaurants in Gothenburg. Last year, 143 young adults from Gothenburg, were employed during the three-hour job fair. During the coming weeks, a follow-up will be done with all exhibitors to find out how many jobs were created at the fair, but it has been confirmed that at least one person was offered a job at site. Among the exhibitors were major companies like Mc Donald’s, Gothia Towers and the Swedish Tax Agency. The fair is built on a partnership between the Trade & Industry Group at Göteborg & Co, Team Göteborg, Gothia Towers / Swedish Exhibition & Congress Center, the Swedish Public Employment Service, Visita and the association Skarpt Läge. Tagged with Jobs fair, Skarpt läge. Published by Pauline Pontois 1 October, 2018 in Trade and industry group. The association Skarpt Läge organized the job fair “At your service” on Friday 28th of September; a meeting place for jobseekers and employers within the tourism industry. During three hours, 754 job seekers came to the hotel Scandic Crown to meet with employers such as Liseberg, Scandic hotel, Casino Cosmopol. The concept is simple: the 20 employers who exhibit at Scandic Crown are all connected to the tourism industry and offer over 150 jobs in hotels, restaurants, tourism and trade. Everyone has something to offer in terms of work, study or internship. “What’s unique with Skarpt Läge is the simplicity. It is easy for companies to participate and for job seekers to meet employers with different recruitment needs all in the same place. But above all, a thorough follow-up and supervision of both participants and exhibitors is made and reported six weeks later” says Lotta Forsberg, one of the project leaders since Skarpt Läge started in 2014. In 2018 the job fair Skarpt Läge resulted in 143 jobs. The follow-up that was done six months later showed that 60% of those who got a job were still working. The previous job fairs that the association Skarpt Läge organized over the past three years have resulted in 3 000 visitors and over 600 jobs. At your Service job fair is based on a collaboration between the Trade and Industry Group at Göteborg & Co, Visita, Scandic, the Swedish Public Employment Service (Arbetsförmedlingen) and the association Skarpt Läge. Tagged with At your service, Skarpt läge. Published by Pauline Pontois 19 April, 2018 in Trade and industry group. 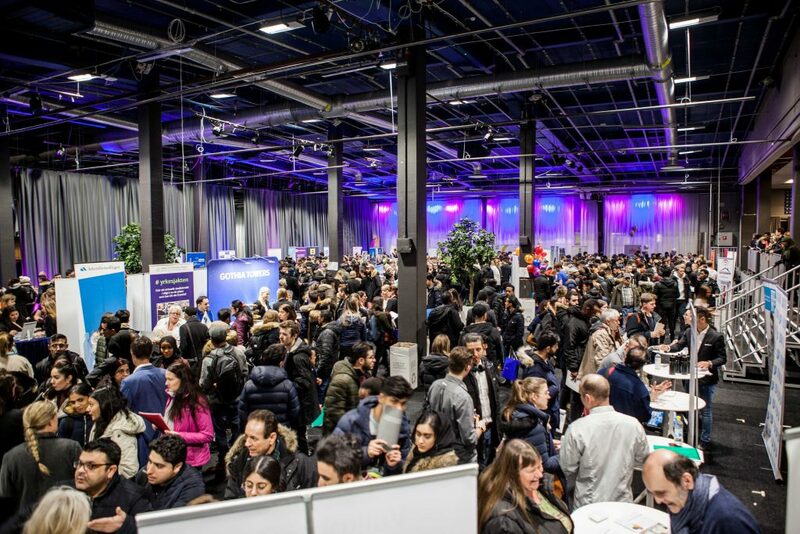 143 young people from Gothenburg were given jobs during the three-hour Skarpt Läge jobs fair that took place on 23 February 2018. The budget for this year’s fair was 200.000 SEK, which works out at 1400 SEK per job. The fair attracted a total of 1,146 visitors in the 18 to 30 age group. The jobs fair continues to grow each year and the value of having a physical place to meet was proven once again. The concept is simple: the 48 employers who exhibited at the Radisson Blu Scandinavia hotel all had something to offer in the shape of jobs, training courses or internships. “We focus on entry jobs. We want to provide a meeting place in Gothenburg that offers young people the quickest route into working life,” says Lotta Forsberg, who has been a project manager since the fair began in 2014. “The unique appeal of the Skarpt Läge fair is its simplicity. It’s easy for companies to take part. And it’s easy for job seekers to meet employers who have recruitment needs, but above all there is reassuring guidance and follow-up for participants and for exhibitors,” says Fredrik Karlsson, Chairman of Skarpt Läge. The fair is built on a partnership between the Trade & Industry Group at Göteborg & Co, Team Göteborg, Radisson Blu Scandinavia hotels, the Swedish Public Employment Service, Visita and the association Skarpt Läge. Despite the fantastic results this is just the start. It is hoped that Skarpt Läge will not only be the best jobs fair for young people in Gothenburg, but that it will become the best platform for young people to gain entry to the employment market in Sweden. Published by Pauline Pontois 27 February, 2018 in Trade and industry group. 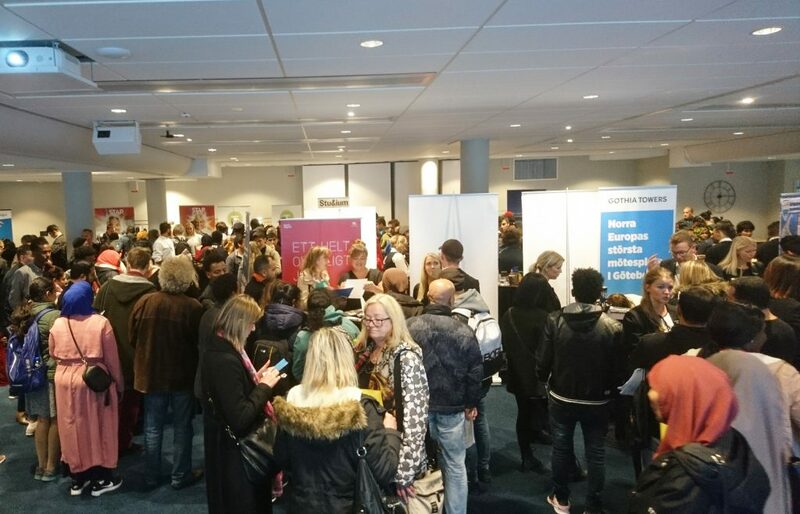 More than 1,100 people came to the Radisson Blu Scandinavia hotel in Gothenburg to visit the Skarpt Läge jobs fair. For the fifth year in a row young adults between the ages of 18 and 30 are matched with companies that can offer them a job on the spot. “Visitors bring their CVs, come to the fair and get to meet 51 exhibitors who all have something to offer. This year there were around 850 jobs available and we had a wide range of businesses represented,” said Fredrik Karlsson Project Manager for Skarpt Läge. There was a lot of interest in Skarpt Läge 2018, and during the three-hour fair 1,146 people visited the fair, which is a slight rise on last year. “The level of interest is high and considerably more young people came on their own this year. It’s clear that we have reached a bigger audience than before,” says Lotta Forsberg, who set up Skarpt Läge together with Fredrik Karlsson. The exhibitors this year included Telia, The City of Gothenburg, Friskis & Svettis and Jollyrum. Skarpt Läge is a joint initiative between Team Göteborg and the Trade & Industry Group at Göteborg & Co, Radisson Blu Scandinavia, the Swedish Public Employment Service and Visita, with the goal of becoming the best job event for young people in Sweden.